In Transport Processes and Separation Process Principles, Fourth Edition, author Christie John Geankoplis offers a unified and fully updated treatment of momentum transfer, heat transfer, mass transfer, and separation processes. Enhancements to this edition include a more thorough coverage of transport processes, plus new or expanded coverage of separation process applications, fluidized beds, non-Newtonian fluids, membrane separation processes and gas-membrane theory, and much more. 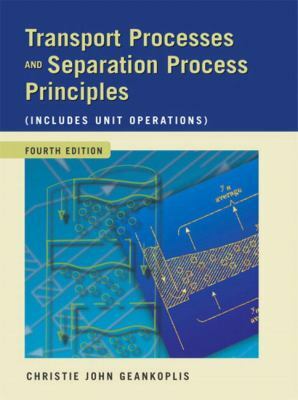 The book contains 240+ example problems and 550+ homework problems.Geankoplis, Christie John is the author of 'Transport Processes and Separation Process Principles (Includes Unit Operations (Includes Unit Operations', published 2003 under ISBN 9780131013674 and ISBN 013101367X. Loading marketplace prices 113 copies from $10.09 How does the rental process work?